I kind of like to eat. But I LOVE to snack. In fact, I literally don’t go anywhere without some kind of snack with me, and, if you look, you’re almost always guaranteed to find snacks in our car, my bags, my jacket pockets, etc. Being somewhere without food is not a risk I’m willing to take, because, let’s be honest, hangry isn’t a cute look on me (or, I guess, really anyone for that matter). So what do I like to snack on, you ask? Short answer: any and everything. I’m kind of only sort of kidding. I will indeed snack on just about anything, but, as a general rule of thumb I try to make sure my snacks are nutritious, whole foods (or made from nutritious, whole foods) and you’ll never really catch me reaching for things like candy and potato chips (unless there is absolutely nothing else in site for miles around and it’s either candy or eating my arm). We do try to rotate a few of our snacks, or occasionally get different items, but as a general rule, we tend to tend to stick to our tried and true favorites. 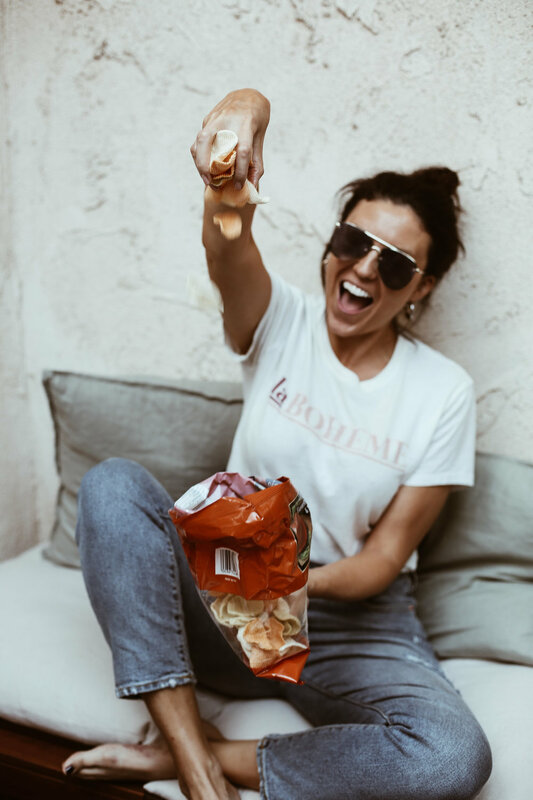 I also make sure to have at least one snack option for each type of snacking category (crunchy, sweet, salty, etc) on hand at all times so that no matter what craving hits, there’s something to satisfy it. 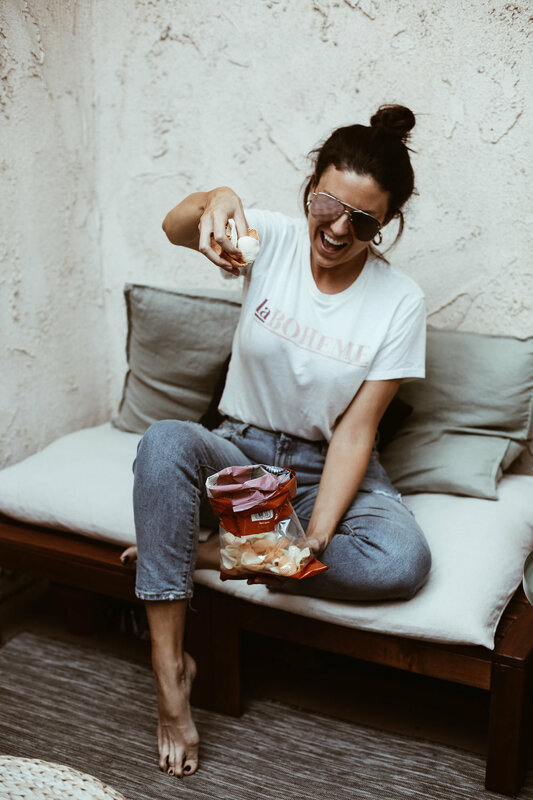 Below, I’m diving into all the details of my favorite healthy snacks, how I like to enjoy them, recipes I use for homemade snacks, my favorite brands for specific products and which options are my favorite snacks to take on-the-go. RICE CAKES // I keep rice cakes (Lundberg brand preferably) on hand for both snacks and meals. Some of my favorite toppings include: nut butter with things like coconut flakes, chia seeds, cinnamon and fruit slices, or, for a savory option, tomato, fresh herbs and hummus or cheese (Bonus points for toasting it until the cheese melts! It’s like a mini pizza!). GF, DF, VEGAN (unless using cheese) + PERFECT IF YOU’RE CRAVING SOMETHING CRUNCHY, HEARTY + SWEET (paired with fruit) or SAVORY + CHEESY (paired with the cheese + tomatoes). DRIED FRUIT // Dried fruit is high in sugar so we don’t have this one a lot, but it’s good for traveling and perfect to satisfy cravings for chewy and sweet candy. GF, DF, VEGAN + PERFECT IF YOU’RE CRAVING SOMETHING SWEET + CHEWY. GOOD FOR ON-THE-GO. DATES // Technically these go under the “Dried Fruit” category, but I wanted to keep them separate because I use them differently then I do most other dried fruit. My favorite date snacks include either a few with some nuts (My go-to nut pairing is hazelnuts. It’s an addictively delicious combo that I could eat endless amounts of!, or with a little cream cheese or cheddar cheese (Sounds strange, but I promise, it’s not!). GF, DF, VEGAN (unless you’re pairing with cheese) + PERFECT IF YOU’RE CRAVING SOMETHING SWEET, CHOCOLATEY, CRUNCHY + INDULGENT (WITH THE NUTS) OR SOMETHING SWEET, SAVORY + CREAMY (WITH THE CHEESE). GOOD FOR ON-THE-GO (the date + nuts combo). FROZEN FRUIT // While I love fresh fruit, I always try to keep some frozen blueberries, cherries and/or raspberries on hand to snack on. Since they’re frozen, they take longer to eat (meaning you eat less overall), it’s basically like eating a sorbet (without all the work) and it’s just an overall quick snack that’s super refreshing. GF, DF, VEGAN + PERFECT IF YOU’RE CRAVING SOMETHING SWEET, COLD + REFRESHING. SMOOTHIES // My alternative to a milkshake or ice-cream. My go-to is cocoa, almond milk, peanut butter or nut butter and frozen banana, but I also like this one, this one or this one. GF, DF, VEGAN + PERFECT IF YOU’RE CRAVING SOMETHING SWEET, COLD + CREAMY. POPSICLES // We have not one, but two, popsicle molds because we love popsicles so much! They’re easy to make and easy to enjoy, and the flavor combinations are endless. You can keep them smooth and creamy, add nuts or chocolate for crunchy, flavor them with different herbs, or keep them fruit based for something light. We usually like to have one batch of fudgesicles (coconut milk, coconut sugar, cocoa powder + sometimes espresso powder) and one batch of fruit-based (like strawberry, orange and mint). GF, DF, VEGAN + PERFECT IF YOU’RE CRAVING SOMETHING SWEET, COLD, REFRESHING + CREAMY. CHIA SEED PUDDING // Great for breakfast, snacks or dessert, super versatile with topping and mix-in additions + a perfect alternative to traditional puddings. GF, DF, VEGAN + PERFECT IF YOU’RE CRAVING SOMETHING SWEET + CREAMY WITH A LITTLE CRUNCH. GOOD FOR ON-THE-GO (just prepare it in a to-go jar or container). NUTS // I especially love hazelnuts, walnuts, pecans and almonds. I always get them unsalted and roasted, or unsalted and raw and then roast them myself at home. GF, DF, VEGAN + PERFECT IF YOU’RE CRAVING SOMETHING CRUNCHY. GOOD FOR ON-THE-GO. NUT BUTTERS // I always buy extra of one of the nuts I get so that I can make my own nut butters. Sometimes I make a plain almond or cashew butter, other times I mix nuts together, but I also like to mix up flavored ones to keep things interesting. For example, I might do almonds, cinnamon, some coconut oil and a dash of cinnamon. Or, I’ll do hazelnuts and dark chocolate for an epic, healthy + homemade Nutella. GF, DF, VEGAN + PERFECT IF YOU’RE CRAVING SOMETHING CRUNCHY, SWEET + FILLING. APPLE OR BANANA WITH NUT BUTTER // Apples and banana are such an easy fruit snack to grab on-the-go (and perfect paired with a handful of nuts), but, if I’m home, I love to enjoy mine sliced and topped with some homemade nut butter. It’s super filling and provides the perfect energy boost to get over the mid-day slump. GF, DF, VEGAN + PERFECT IF YOU’RE CRAVING SOMETHING CRUNCHY, HEARTY + SLIGHTLY SWEET. CHOCOLATE // I can’t go a day without some sort of chocolate. I prefer to make my own Peanut Butter Cups (or other nut butter cups), have a piece of a snack bar (This is one of our favorite recipes! ), or mix up my own chocolate (To make my own, I mix cocoa powder, coconut oil + coconut sugar or maple syrup to make a paste-like mixture, then spread the mixture out on a piece of wax paper, adding toppings if desired, things like salt flakes, chopped nuts, nut butter, then pop it into the freezer for at least 10 minutes, or until hardened.). But, I typically also keep some Lily’s, or another healthy chocolate bar on hand, for when I don’t have time to make anything. GF, DF, VEGAN + PERFECT IF YOU’RE CRAVING SOMETHING SWEET + CHOCOLATEY (and/or crunchy and sweet). BARS //I’m very picky about the bars I get since many of them have lots of unnecessary and icky ingredients. So, we only have ones with whole ingredients, such as Lara Bars, RXBARS, or, if I have time to make them, a batch of these bars. I specifically keep bars on hand more as a grab-and-go option, and less as an every day snack, but I will reach for one if I’m craving something like a cookie. GF, DF, VEGAN (depending on brand) + PERFECT IF YOU’RE CRAVING SOMETHING SWEET BAKED GOOD.GOOD FOR ON-THE-GO. GRANOLA // I usually reserve my granola (homemade always) for breakfast, but if I’m snacking on yogurt and want to add a topping, granola is my go-to. It’s also a good sweet + crunchy snack to take on-the-go. GF, DF, VEGAN + PERFECT IF YOU’RE CRAVING SOMETHING CRUNCHY + SWEET. GOOD FOR ON-THE-GO. YOGURT // Similarly to granola, I usually reserve yogurt for breakfast, but if I’m craving something creamy, I’ll reach for yogurt. I like to add a little maple syrup and things like coconut flakes, chia seeds, nuts and fruit, or, if I’m craving something more along the lines of a chocolate pudding or mousse, I’ll add a little cocoa powder, coconut sugar and a splash of vanilla and stir it until it’s combined. Sometimes I’ll also add in chopped nuts or chocolate. Either way, it’s super creamy, chocolatey and delicious (We love it so much that we actually have it as dessert typically several times a week!). If I’m looking for creamy and savory, I’ll make a little dip by adding some season gins + fresh herbs to my yogurt, then pairing it with crackers or fresh veggies. GF + PERFECT IF YOU’RE CRAVING SOMETHING SWEET + CREAMY or SAVORY + CREAMY (depending on what you choose to add to the yogurt). KOMBUCHA // I wasn’t going to originally include this on the snack list, because it’s a drink, but I do have a kombucha (typically GTS brand) every day, either with lunch or with my snack and wanted to include it because I think it’s a great alternative to soda/pop/carbonated beverages (if you’re trying to wean yourself off one of those), or, if you’re trying to drink less, in place of a cocktail with dinner. GF, DF, VEGAN + PERFECT IF YOU’RE CRAVING SOMETHING SWEET, COLD + BUBBLY. PLANTAIN CHIPS // I could easily go through a bag of these in one sitting, because they’re that good! Perfectly crunchy + salty, high in potassium, no sugar + made with minimal ingredients (It should be nothing more than plantains, a little coconut or olive oil and salt.). They’re a great alternative to potato chips and taste amazing alone, but they’re also delicious with guacamole or hummus, if you’re looking to round out your snack with some healthy fats or proteins. GF, DF, VEGAN + PERFECT IF YOU’RE CRAVING SOMETHING CRUNCHY + SALTY. GOOD FOR ON-THE-GO. PICKLES + OLIVES // One of my favorite go-to’s that we try to always keep on hand. I like to buy mixed marinated olives and, for the pickles, I prefer to make my own (just slice cucumbers then add them to a mason jar with a little salt and sugar + cover with apple cider vinegar). GF, DF, VEGAN + PERFECT IF YOU’RE CRAVING SOMETHING CRUNCHY, REFRESHING + SALTY. FRESH VEGGIES // I like to keep carrots, celery, cucumber, radishes, green beans, snap peas and peppers to snack on. They’re also great to add to salads, paired with a yogurt dip, hummus, or tahini, or throw in a bag to take on-the-go. GF, DF, VEGAN + PERFECT IF YOU’RE CRAVING SOMETHING CRUNCHY + REFRESHING. GOOD FOR ON-THE-GO. VEGGIE CHIPS // This is my go-to alternative to potato chips. We buy ours at Trade Joe’s, but you can find veggie chips anywhere. Just look for ones that are made with nothing more than vegetables, olive oil and a little sea salt and/or herbs. GF, DF, VEGAN + PERFECT IF YOU’RE CRAVING SOMETHING CRUNCHY + SALTY. GOOD FOR ON-THE-GO. SWEET POTATO // We always have sweet potatoes on hand, and while they’re typically reserved for lunch or dinner, if I need a hearty, filling snack or alternative to fries, this is my go-to. Just dice, saute in a little olive oil for about 10 minutes, or until crispy and enjoy with your favorite seasonings. Some of my faves include Trader Joe’s Everything Bagel Seasoning, Tabasco sauce (the green kind), truffle ketchup, truffle salt, scallions, fresh herbs, tahini, chopped nuts, liquid aminos or sesame oil (I especially love doing sesame oil, tahini, scallions and Everything Bagel Seasoning.). GF, DF, VEGAN + PERFECT IF YOU’RE CRAVING SOMETHING WARM, COMFORTING, HEARTY + SAVORY. CRACKERS // I try to keep some sort of whole grain cracker on hand to pair with cheese, nut butters, tahini, hummus, whatever I want. It’s a great base to build into whatever snack I’m craving and is great if you just want a little something before dinner, or a full on afternoon snack. PERFECT IF YOU’RE CRAVING SOMETHING CRUNCHY. GOOD FOR ON-THE-GO. HUMMUS/GUACAMOLE/SALSA // Because it’s always good to have a healthy pairing for your veggie sticks, veggie chips or crackers. GF, DF, VEGAN + PERFECT IF YOU’RE CRAVING SOMETHING CREAMY + SAVORY.